Beautifully Designed Funny Wine Glass! She will enjoy a relaxing evening with her new funny wine glass, which holds 15 ounces of her favorite wine! "Does this ring make me look engaged?" is printed on one side. 100% Clear Glass material, which is Dishwasher and Microwave safe. It's a fantastic gift idea she will love! We guarantee she will love it - that's why we offer you a money back warranty in case you don't! So What Are You Waiting For? Order Your Own Unique Wine Glass - While Supplies Last! CONVERSATION STARTER! 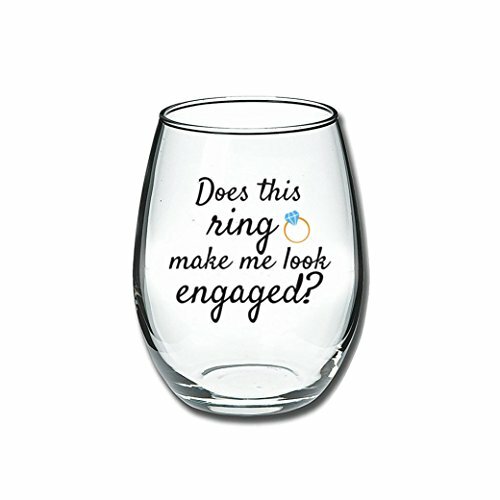 - Enjoy a relaxing evening with your new favorite stemless wine glass, which reads Does this ring make me look engaged? Holds 15 ounces of your favorite white or red vino. THE GIFT THAT KEEPS ON GIVING - What's better than giving a stemless wine glass for a wino or wine lover. Every time they drink their precious wine they will think of you. TOP QUALITY - Made in the USA with the highest quality materials that can guarantee its long life and their constant satisfaction. The wine glass that can ensure an enjoyable evening dinner for many years! DISHWASHER SAFE - Printed with superior ceramic inks that are fired on at a temperature of up to 1200 degrees. A truly permanent imprint that will never fade or lose its glow. CAREFULLY PACKAGED - Each Wine Glass is carefully packaged in a durable gift box; guaranteed to arrive safely with free shipping through Amazon Prime. If you have any questions about this product by Funny Mugs, LOL, contact us by completing and submitting the form below. If you are looking for a specif part number, please include it with your message.